Gavin House Instructor runs a professional driving school in Farnborough offering a great variety of driving lessons in Farnborough, Aldershot, Camberley, Reading, Guildford and Fleet areas. Often referred to as the best driving instructor near Camberley, Gavin House Instructor caters for everyone from beginners looking to get on the road to international drivers looking for conversion lessons. After reliable driving instructors in Farnham or a trustworthy driving instructor in Guildford? 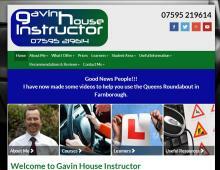 Gavin House is RED qualified and has even been a driving instructor at Goodwood! So, whether you are learning to drive, looking to boost your confidence when driving or looking for motorway experience, Gavin can help. The driving school in Farnborough, Hampshire is open six days a week and you can learn to drive in a fully insured, practical Ford Fiesta. Gavin can help with both your theory and practical driving tests. If you are looking for local driving instructors in Fleet, Farnborough, Basingstoke, Camberley or Aldershot contact Gavin House Instructor!